Just back from a phenomenal performance of Tom Stoppard’s Indian Ink, directed by Carey Perloff. Saw Ms. Perloff in the foyer after the play and I told her that our first play at the Geary Theater was the ACT production of Indian Ink in 1999. We came back each year as season ticket holders for 15 years after that, and our numbers grew as the ACT plays became a way for our extended family and close friends to meet in the city. Now here we were at another production of Indian Ink. She told me it was full circle for her too as Firdous Ramji had played the son Anish Das in 1999 and now in 2015 he was playing the father Nirad Das! Stoppard’s interweaving timelines are masterfully staged by Perloff at the Geary and that was what had enticed us in 1999. Since then we have seen excellent depictions of parallel timelines in The Invention of Love and Arcadia and now again in India Ink. Brenda Meaney as Flora Crewe was both earthy and ethereal as demanded by the play. Her friendship and subsequent relationship with Nirad Das was crackling with chemistry. 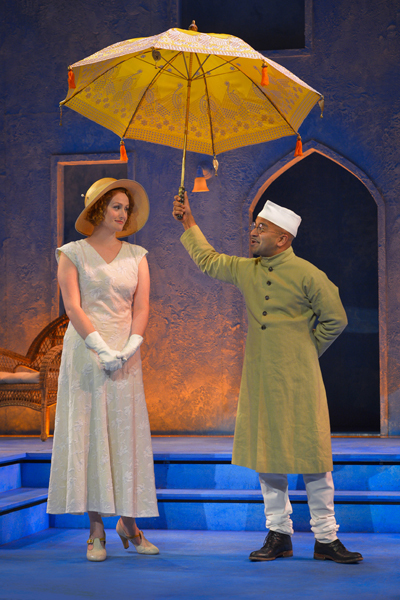 Roberta Maxwell as Eleanor Swan and Pej Vahdat as Nirad Das’s son Anish kept the mystery of Flora’s sojourn in India alive as they slowly peeled away the layers of the past. Who was Flora Crewe and what was her relationship with the painter Nirad? Anthony Fusco played Eldon Pike, searching for the details of Flora’s life, bungling his way through the mystery one footnote at a time. If you have not seen it yet, then you have exactly one week to do so! This one is not to be missed.